When we think of Australian men, we often think of a no nonsense, straight talking as it is bloke and that is exactly what the Essentially Pure Delights Stache and Beard Bar from The Great Australian Beard Co is from the wrapper to the soap itself! On the black and white label it says ‘Stache and Beard Bar, for Blokes that care!’ I guess really it doesn’t need to say much else, it’s a soap for our beards, job done! It contains Saponified oils of Olive, Coconut, Sunflower, Rice Bran, Distilled water, Cocoa Butter, Avocado, Argan, Neem oils, Benzoin, Rosemary essential oil, Candelilla wax, sugar, salt and so I guess that makes it vegan? I apologise I am no expert about vegan products! 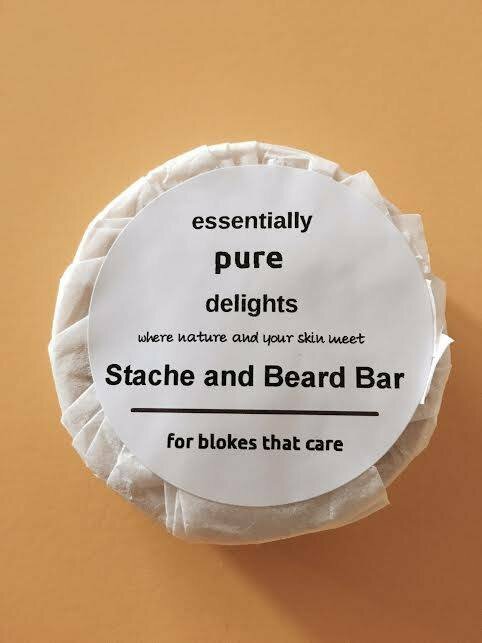 But what I can tell you is that the Essentially Pure Delights ‘Stache and Beard Bar’ from The Great Australian Beard Co costs $12 and that is only £7.02 at today’s exchange rate (5th Dec 16) and that is great value for a soap that could potentially last a year! The soap is available from The Great Australian Beard Co website where you will find all your beard care needs and more and what’s more is that its free International shipping on all orders over $60 AUD, now that is an offer that brings these Australian products into the beards of the guys all over the world, so many times I review amazing products but the international shipping means they end up too expensive!